Everyone’s favorite mosh-pit polka band returns to Arlington, Texas, this Friday to kick off Levitt Arlington’s 2015 Fall Concert Series—continuing an annual tradition that started when the band kicked off the venue’s very first concert in 2008. This two-time GRAMMY-winning band has wowed Levitt audiences across the nation, with performances at Levitt Arlington (2008-2015), Levitt Los Angeles (2007), Levitt Shell (2008, 2011, 2013) and Levitt Westport (2009, 2012). With joyful music and contagious energy, Brave Combo is inspiring a new generation of polka fans. Brave Combo has been shaking up the music industry with their unique fusion of rock, worldbeat and polka since 1979. To date, they’ve taken home two GRAMMY Awards for the Best Polka Album category (Polkasonic, 1999 and Let’s Kiss, 2004). Beyond the music world, the group has left their mark on pop culture as a whole. See if you recognize them from any of their appearances below! The Gumby soundtrack: Brave Combo contributed two tracks to the soundtrack for the clay animated 1989 film, Gumby, one of which you can listen to here. 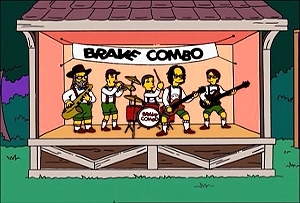 Futurama: Three Brave Combo songs were featured in a 2012 episode of Comedy Central’s animated science fiction series Futurama. David Byrne’s wedding: Speaking about the band’s bold decision to use polka as the cornerstone for their eclectic sound, Talking Heads co-founder David Byrne recalls, “It was a way of taking something completely uncool and flipping it on its head and making it more acceptable.” In addition to including Brave Combo’s music in his film, “True Stories,” Byrne selected Brave Combo to provide live entertainment for his ‘big day,’ when he tied the knot with costume designer Adelle Lutz in 1989. Check out the video below to watch some Brave Combo interviews and performances before their show at Levitt Arlington this Friday! And for folks in Arlington, Bellingham, Bethlehem, Charlottesville, Cleveland, Memphis, Middlesboro, Pasadena, Sheboygan, Trenton check out the other free Levitt shows happening this week! This entry was posted in Spotlight Series and tagged Bob Dylan, Brave Combo, David Byrne, Levitt Arlington, Levitt Los Angeles, Levitt Shell, Levitt Westport on September 2, 2015 by Nicole McGaffey.